WOODBURY — The Middletown bench was eerily quiet as they trailed by 13 points to Monroe-Woodbury late in the second quarter. Senior guard Conor Coffey had already hit three 3-pointers, and senior forward Chris Lulgjuraj was 4-of-4 from the field for the Crusaders. With 2:22 left in the second quarter, Middletown head coach Jim Kelly called a timeout and rallied his team together. Soon after, they began a full-court press, hindering the Crusaders from moving the ball as freely as they did earlier in the game. The full-court press was successful, as Middletown went on a 17-0 run after they began pressing. They pressed all the way until the final seconds of the game, winning 60-47 in a Class AA Division I matchup. 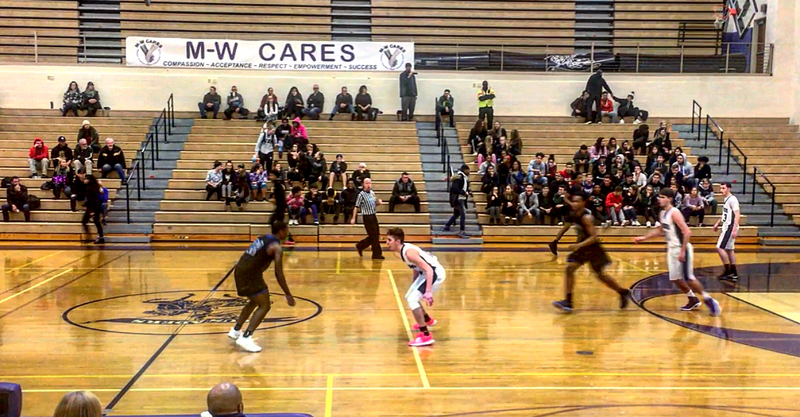 The Middies leading scorers Marquis & Keon Gill were benched in the first half for reasons detrimental to the team. Middletown (3-0) outscored Monroe-Woodbury 25-12 when the Gill’s were on the floor. In only a quarter-and-a-half of playing time, Keon finished with 12 points and Marquis had 11 points. In his first start of the season, senior forward Noriel Brown led the Middies in scoring with 13 points, including three 3-pointers. Monroe-Woodbury (2-2) was led in scoring by Conor Coffey, who had 18 points and senior guard Nick Memoli who had 11 points. The Middies next game is versus Kingston (5-0) next Wednesday. Kingston is led by Section 9’s top scorer Brian Moore, who’s averaging 31.7 points per game.